How many casinos do you know who have custom-made, exclusive games? 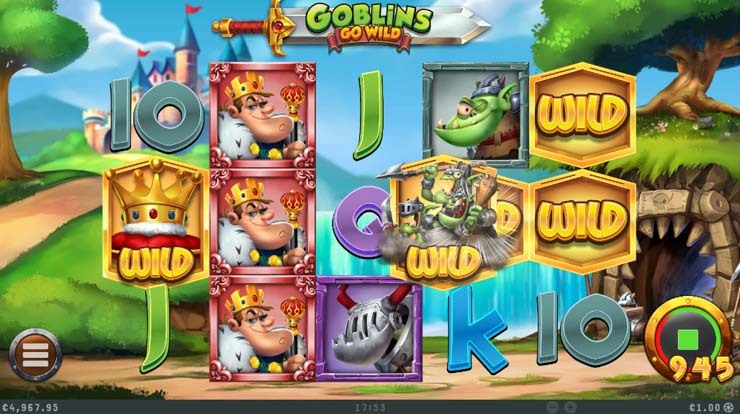 There are not many I can tell you that, so when a favourite online casino like Casumo comes out with a video slot Goblins Go Wild, things get really exciting. This 2019-released slot is nicely balanced for a casual player and doesn’t fool around with simple math – it’s got x4 Special Wilds in the base game, a pick-me bonus and free spins which are played out “battle royale” style! Let’s see if it’s got what it takes to take on big guns like Yggdrasil’s head-smashing Vikings Go Wild series. 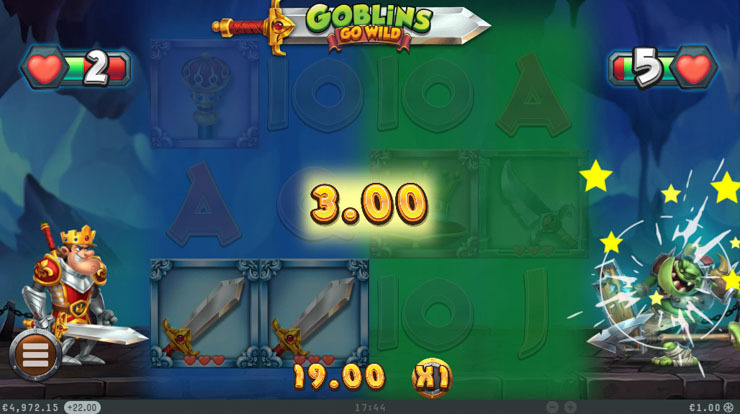 Goblins Go Wild has 5 reels and 20 fixed pay-lines, which expand all the way up to 81 lines in one of the bonuses. It’s low volatility and medium variance, and with a max payout of 10,000x the total bet per spin during unlimited free spins, this game has great potential to be fun and rewarding even during short sessions. Note: The game is exclusive to Casumo casino. 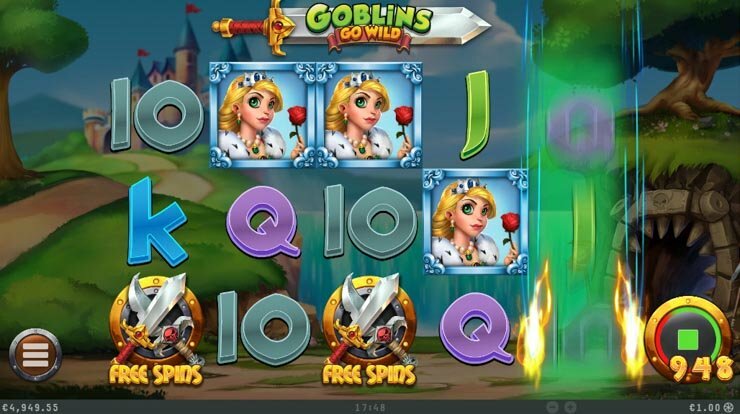 Here’s Goblins Go Wild slot bonuses explained + check out the bottom for casino bonuses that you can use to try the game with more credit. Wilds can chase each other to create paths of wild symbols. 5x low-paying symbols: these include Ace, King, Queen, Jack and 10. 5x high-paying symbols: three goblins, the Princess and the King. You need at least 3-of-a-kind on a line to win, which is up to 500 coins per symbol. By the way, the King symbol can also appear stacked and on good runs even fill up half or more of the screen. But it gets even better thanks to 4 unique wilds. There’s the Regular Wild and four Special Wilds: King Wild (reel 1 only), Crown Wild (reel 1), Goblin Wild (reels 3 and 5), and Serpent Wild (reels 2 and 4). All have a unique behaviour they can explode, expand and chase. Watch out for a combo of Goblin Wild + King or Crown Wild, which create some of the crazier combinations of wild symbols on the entire reel-set. Some wild symbols expand, like this one. 👍 Tip: If you like wild features in the base game then you’ll also love Thunderkick’s Rocket Fellas Inc, which has a thrilling combo of rockets and wild symbols, but also Sticky Wilds and other cool features to follow. Available at Casumo. Get the Bonus symbol on reels 1, 3 and 5, and you’ll trigger a chest bonus. You’re guaranteed to win in this one, but choose carefully, because only one of them has a 100x the total bet prize in it! Win up to 100x your total bet in an instant pick-n-win game. All 5 possible total bet win multipliers are: x5, x10, x15, x25 and x100. Reflecting on my own experience, there was one session when I triggered this bonus every 10-20 spins and got almost 50x the total bet out of it. At other times, you may wonder if it even exists. 🎁 Did you know? – Casumo casino now also has Must Drop Jackpots that drop daily! Be sure to check out a quick intro on that in my earlier post HERE. Last but not least, the free spins. Get 3x Free Spins symbols to trigger the main bonus. Get a Free Spins symbol on reels 1, 3 and 5 to win Free Spins with no limit. It’s a battle between goblins and the royalty! The game will transform into 81 pay-lines and a 4×4 reel. The symbols will pay both ways, with the King on one side and a Goblin on the other. Each time you defeat a Goblin, you’ll win a +1 multiplier. So if all goes really well, you can 4x your free-spins winnings at the end of the bonus! Watch out for special symbols with boosted wins that can get you all the way up to 10,000x the total bet! Free Spins bonus: unlimited spins + win multipliers. The free games end only when the King is defeated, so the freebies rally can last for quite some time. 🔥 Similar games with unlimited Free Spins: Wish Upon a Leprechaun (Blueprint Gaming) and Taco Brothers (ELK Studios). Available at Casumo. 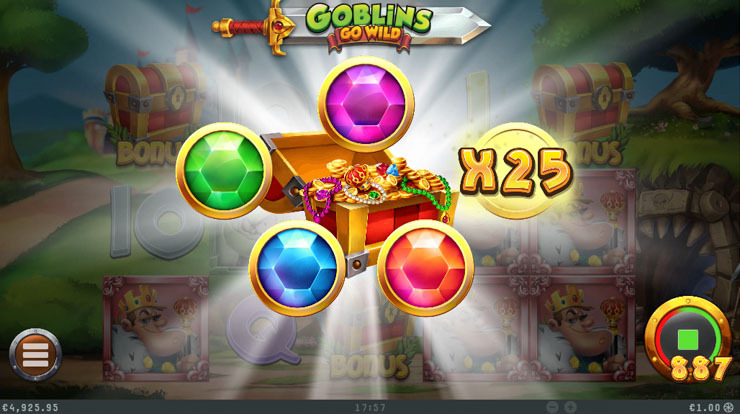 Goblins Go Wild is a great online slot for players who look for a relatively low-risk game, but also don’t mind a bit lower RTP of 94.96%. Players looking for more risk and something more traditional should check out other games like GiG Games’ Book of Souls (full review). 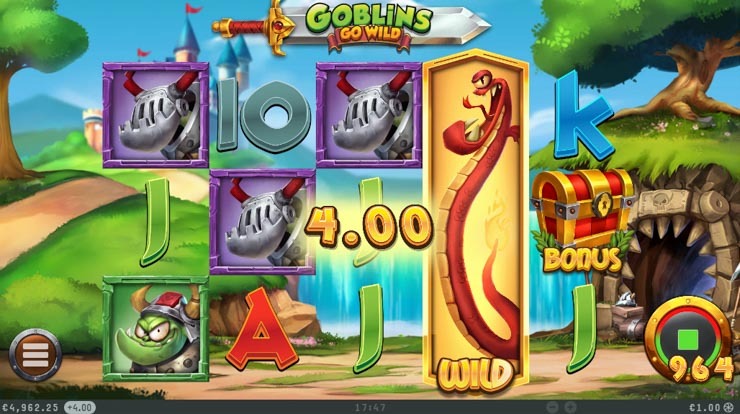 You can play the Goblins slot for free or real money right now. If you’re serious about giving it a go, then I recommend you also claim the first-deposit welcome bonus, which will get you more chips to play with! 👑 Play now at Casumo: Get up to €/$50 on your first deposit to try it out. P.S. See also other exclusive Casumo slots like Tales of Dr. Dolittle and Adenture Cab.